Appalachian Heritage presented the 4th Annual Groundhog Homecoming 2008 February 2nd, 2008 at the Cardington American Legion Post. Doors opened at 6pm and the festivities kicked off with an open jam session, with another between band performances. Grassahol performed at 7:00, and Appalachian Heritage took the stage about 8:30. Renfro Profitt and his wife Della came all the way from Kentucky, so Renfro could do the guest appearance with Appalachian Heritage. A big thank you to the 35+ friends and family members that helped make this event a success. 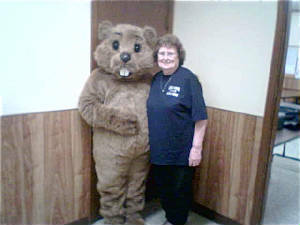 What would a Groundhog's Day party be without a Groundhog. All contents of this site are protected under US and International Copyright Laws.